Stamping Stuff: Jumping Rope ..... errr Ribboon! 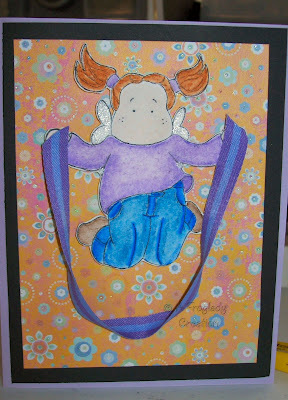 This is another of the Tilda images I had received in a pack I bought of stamped images. I colored her using my Prisma Color pencils and used my SU blender to pull to color in and around. I used a piece of ribbon from Really Reasonable Ribbon for the jump rope. Paper is from DCWV Pocket Full of Posies pad and then solid color card stock from the Paper Place, Wellington, OH. I added some Stickles on her wings to make them sparkle, it is hard to see in the scan but they do :) I also used some of the SUPER STICKY foam dots to mount her on top. I love those things! If you missed my post about Jody's sticky sale then hurry and scoot back a few days and look for it. It is a great bargain! thanks for looking today - have a wonderful Sunday!